Maxwell Miles has an introduction familiar with many a comic enthusiast. An awkward teen, Max feels out of place in school. A bit of a social pariah, Max does have an extraordinary talent. He can mimic anything he sees, though he needs five minutes to absorb and implement the things he sees. Anything, from playing basketball against players twice his size, to dodging the powerful blasts of attacking aliens, Max can do it all, given the time. This is the opening of Miles Away, the new graphic novel from actor, musician and writer Anthony Montgomery. While you are most likely familiar with Anthony Montgomery from his role as Ensign Mayweather on Star Trek: Enterprise, Miles Away has been a long time project of Mr. Montgomery. 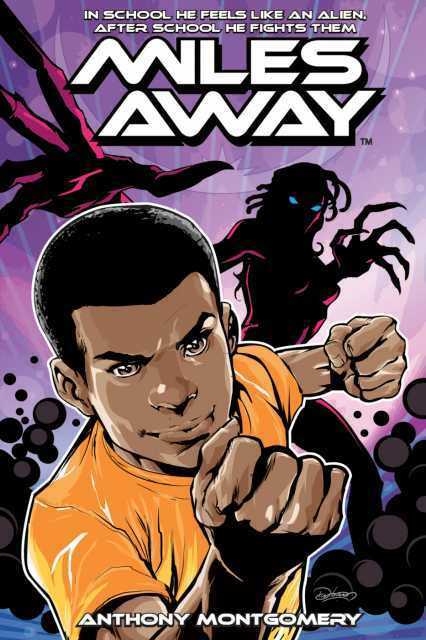 Originally envisioned as a television series, Miles Away has been translated well into comic form. Many other film to / television to comic translations come out reading like nothing more than loose storyboards with stumbling dialogue. Miles Away distinguishes itself with clever, witty writing from Montgomery and Brandon Easton and great art from Jeff Stokely and Jey Odin. Miles Away reads quickly. We only just get acquainted with Max before the story shifts to another part of the universe. We are introduced to a brash alien prince and his sister, heirs to a gleaming kingdom built on the promise of protection from an ancient evil. Not long after we are familiarized with these characters, the novel is over. I have to say, the end of the novel was the one disappointment I had with Miles Away. I am no novice when it comes to graphic novels, however. I know that this is how the game works. Well, Mr. Montgomery, you've won this round. I am sold on Miles Away. Though I had my doubts when I first heard of Max's ability, Montgomery and Easton have integrated it so well, that it never felt out of place. It's a difficult ability to work into a traditional graphic novel format, but the potential for a "margin of error" in the titular characters ability added depth and suspense to the story. Some of the tertiary characters were a bit less fleshed out, and I found myself wondering more about their own origins. This is not a problem with Miles Away specifically, but more an inevitable consequence of the format. Introductory issues are meant to leave readers with questions. It's been a long road for Mr. Montgomery to get Miles Away this far. All that time and struggle has paid off in a graphic novel that you can tell was a labor of love. There is serious depth and motivation in these characters. Max is not some archetypal angsty teen; instead we are given a character that reads as a caring, if naive and impulsive person. The conflict in the novel come across as real and the characters show a real investment in the issues they face. Miles Away is a solid graphic novel. I highly recommend it. I enjoyed it's wit and artistic polish. The layouts were exciting and showcased the action very well. The characters are interesting and Miles' powers are unique and very well meshed into the story. It's a great read for adults but not too violent for younger readers. Whether a veteran of graphic novels or looking for an introduction, Miles Away is certainly worth reading.